When I saw this photo from glittergraphics I could well imagine how Anne Shirley felt when she caught her first glimpse of the lane of apple trees in full bloom. Do you remember the part when Matthew Cuthbert drives Anne home from the train station to Green Gables? "They had simply rounded a curve in the road and found themselves in the 'Avenue'. The Avenue, so called by the Newbridge people, was a stretch of road four or five hundred yards long, completely arched over with huge, wide-spreading apple-trees, planted years ago by an eccentric old farmer. Overhead was one long canopy of snowy fragrant bloom. Below the boughs the air was full of a purple twilight and far ahead a glimpse of painted sunset sky shone like a great rose window at the end of a cathedral aisle. It's beauty seemed to strike the child dumb. She leaned back in the buggy, her thin hands clasped before her, her face lifted rapturously to the white splendour above. I've never had the pleasure passing under such a bower of beauty, but this lovely photo gives, as Anne herself would say, 'scope for the imagination'. Aren't you glad for the gift of imagination? Brenda, thanks so much for your comment on my art show post. Life does indeed happen. I am such an "Anne of GG" fan, that I immediately thought of her when I saw the photo you posted. I was watching some online clips from the movie just yesterday and what a treasure it is. I have the DVDs but not always the time I'd like to sit and watch. So pretty! Wouldn't it be wonderful to stroll down that lane!?? spring is so lovely and we have seen it in several different states and stages of development. now in california it begins again. Now that was a great movie series. Thanks for bring back a great memory. Have never seen apple tree blossoms like that. Can you believe that? Apple trees don't grow well here. Loved Anne (with an 'e') of Green Gables. Raising three daughters presented many opportunities to see Anne of Green Gables. This visit took me back...thank you for that pleasant memory and the beauty that went with it. Yes, I have had the joy of this journey and it is remarkable indeed. Many other journeys...like to the south of France...I enjoy through imagination. Thank you for a lovely post! What beautiful tree's. 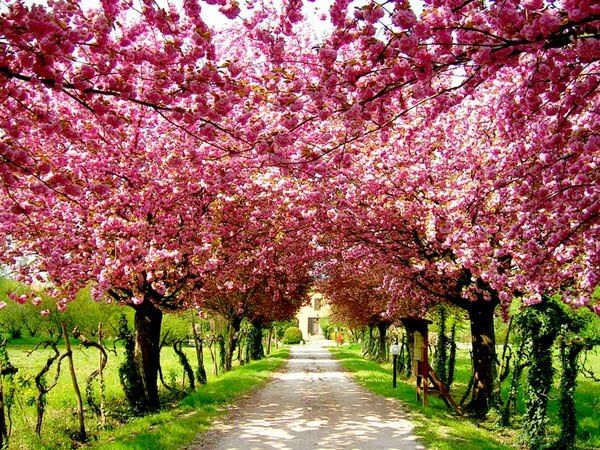 i would love to walk down this pathway with you !